The cover of Blunt Instruments as illustrated by Bryn Casey. Blunt Instruments is the sixth short story in Halo: Evolutions - Essential Tales of the Halo Universe. 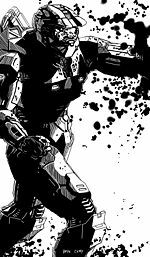 Written by Fred Van Lente, the story shows SPARTAN Team Black when the demolition of a Covenant Beacon on Verge goes terribly awry. Sometime during the Human-Covenant War, Team Black is sent to eliminate a heavily-fortified Covenant Beacon within the ruins of Ciudad de Arias on the UNSC Colony world, Verge, in order to cut off supply of Helium-3 to Covenant ships blockading Tribute. While finding a safe room for Team Black to sleep in before the Op, Black-Two discovers a mutilated Yanme'e, nicknamed Hopalong, lying on its back and struggling to help itself up. When Black-Two decides to flip the Yanme'e over to gain intelligence, Hopalong upgrades her translation systems so that they could communicate. Because Hopalong was a prisoner to the Covenant overseers, it decides to co-operate with Team Black so that it can free its fellow inmates. Although Team Black is uneasy with Hopalong's presence, Black-Two convinces her squadmates that they can trust the alien. The next morning, Team Black proceeds with their mission in destroying the Beacon with a C-12 "blow-pack". Hopalong guides the Spartan Fire Team through a wrecked apartment complex's basement, where a tunnel has been hollowed out by Yanme'e inmates. Thought to be uninhabited, the team soon discovers hundreds of sleeping Yanme'e nesting throughout the tunnel. After making it through the tunnel unscathed, they engage the Covenant forces. Hopalong then uses this chance to free the Yanme'e inmates, and Team Black then realizes that the Yanme'e used for excavation were not actually slaves, but hostile prisoners. When Team Black is assaulted by a swarm of Yanme'e, they lose contact with Black-Three. While Black-One and Black-Four make their way to a train to evacuate the area, Black-Two goes to find Black-Three who is struggling with the Yanme'e. She manages to save Black-Three, and she tells Black-One to start the train while being attacked by Yanme'e with grappling devices. Black-Two and Black-Three make it aboard the train after using the detonation device as a distraction to the swarm. Team Black then rides the train to be picked up by a Pelican dropship in a safe landing zone.